January, February and March 2014 have treated us to the return of Prince and Kate Bush, a new Mogwai record and some incredible records by the likes of War on Drugs and I Break Horses. No matter how much time you dedicate to keeping up, you're bound to have missed a thing or two, so here's a quick rundown of the most read threads, features and reviews on DiS so far this year, but first here are five pieces which didn't make it into our most read section that are well worth your time and attention. 1) Opinion: Spotify vs DIY: It's Better Than The 0p Acts Receive From Piracy, But... - musicians aren't all doomed! 2) Interview: DiS meets Radiohead's Colin Greenwood - Dom Gourlay had an interesting chat about the early days of Radiohead and the UK's best small venues to coincide with the inaugural Independent Venue Week. 3) Opinion: Messy Lesson: How Liars are setting the blueprint for electro transformation - J.R. ponders why Liars are brilliant. 4) Interview: DiS Meets Slint - this was a bit of a coup for us to secure, so we ran the extensive chat as a two part piece. 5) Interview: Max Richter discusses revisiting Memoryhouse - a DiS classic, revisited. 1) Review: I Break Horses - Chiaroscuro - probably my favourite album of the year so far (bar Chino from Deftones' †††'s). Humungous sprawls of digital soundwaves and expansive post-shoegaze-ness. 2) Review: Marissa Nadler - July - Andrzej our reviews editor and I adore this record. Hints of sunrise cracks through the goth-folk veneer. It wouldn't shock us if a soundtrack or some viral internet anomaly didn't turn Marissa into the new Lana, but then she's worked with a chap from SunnO))) so that sort of 'success' isn't why Nadler makes music. 1) Opinion: Steven Ansell from Blood Red Shoes: Is music becoming a passive experience? 5) Social: What's your SnapChat username? Sign Up: Join our mailing list to get our recommendations and monthly playlists (Please note: this is a new list, and it's quite likely you'll need to rejoin as we can't export our old list). Browse: DiS' Recommended Records section - hundreds of high-scoring records, hand-selected by our editors. Browse: DiS Recommended Reading - articles featured by our editorial team recently, and over the past few years. 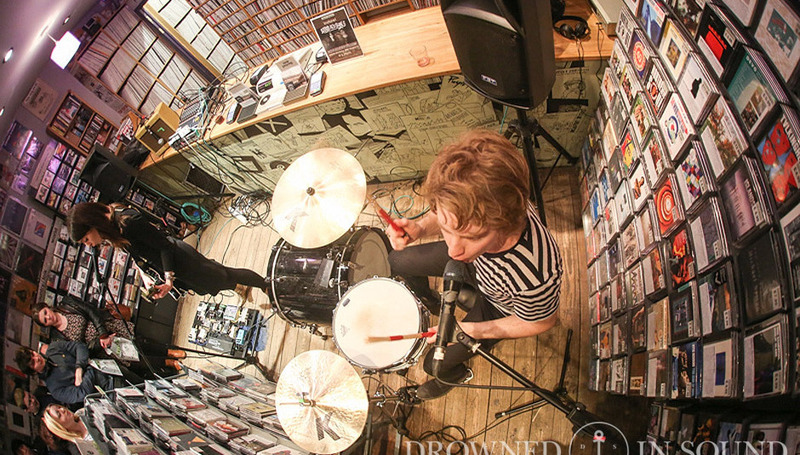 Photo of Blood Red Shoes by Mike Burnell (full gallery).